While many of you “sneakerheads” are fixated on your Jordans, there is a new powerhouse in the sneaker world that has come up right under your nose. Apart from most people in NYC who have already been aware of this phenom, I find it to be my civic duty to let the readers of BLVD AVE know what they are possibly missing. That was the NYC native, Ronnie Fieg, on his last trip to Chicago back in 2010, talking about his aspiration for KITH. Ronnie first opened Kith in Brooklyn a few years back with a simple idea in mind: open a mens only shoe store that with pieces that look good, are only made from the highest quality material, and are sold at an affordable price. Maintaining these principles seems to be a rarity around the sneaker world as of late, which is why it is apparent that Fieg and Kith have been killing the game. Both Kith locations (Manhattan and Brooklyn) are connected to Atrium, a staple denim shop on NYC. His idea was to allow customers to buy a pair of jeans, then walk through the door adjoining the two stores and purchase a pair of shoes or boots to go along with them. His vision seems to be working out pretty well considering the popularity and ever-increasing hype of everything he touches. He is the Midas of this world. Not to mention Kith has started manufacturing a few apparel pieces as a part of their Kith NYC “Red Label.” Earlier this summer they dropped a collection of jackets and bottoms all featuring some kind of camo or animal print, which, like everything else he touches, sold out instantly. He has a new release under their Red Label dropping this Friday (7/20) featuring a solid run of shorts. You can also expect a killer collaboration with Herschel Supply Co. dropping the same day. As Ronnie’s business plan continues to prosper, he is able to venture deeper into the fashion world. He helped release the “Just Us” Chelsea frame by Tina Catherine last week and, once again, struck gold. Check out kithnyc.com for all kinds of goodies. He constantly keeps in stock his collection by Sebago, a boat shoe company which never disappoints, as well as classic silhouettes from New Balance, Puma, Adidas, Nike, and many, many more. 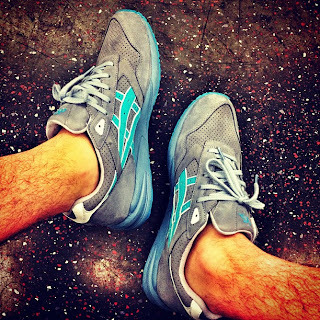 The Asics Gel Saga "Neptunes" due to release sometime later this summer. If you haven’t heard of Ronnie Fieg, get your head out of the ground. You’ll surely hear of him soon. thanks Russty !! We appreciate the love !! !